English Springer Spaniels are undeniably beautiful dogs. Is a Springer right for me? Their distinctive markings and long ears make them very appealing. It is no surprise that several thousand of these pups are registered each year with the English Kennel Club alone. However, the Springer is not just a pretty face. This lively and outgoing dog requires a lot of time, attention and commitment to turn into the perfect family pet. 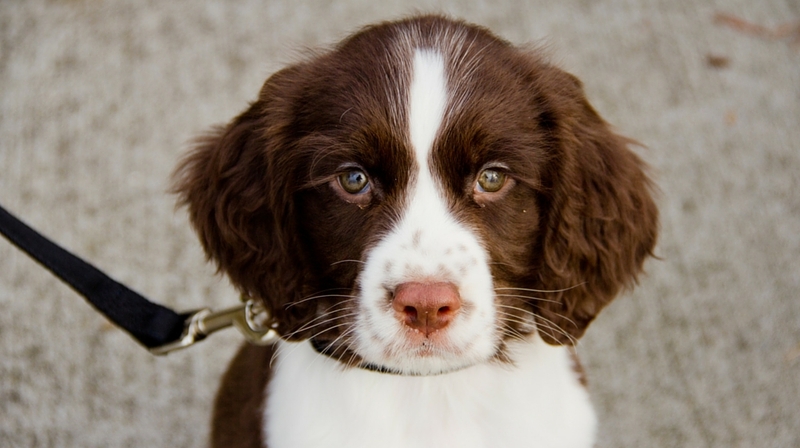 In this article we will take a look at the English Springer Spaniel. Helping prospective puppy buyers to find out what they are committing to when they decide to bring home a Springer Spaniel puppy. From temperament to exercise needs, daily care to training and health, we will give you a complete guide to the English Springer Spaniel. To help you decide whether this really is the best dog for you and your family. 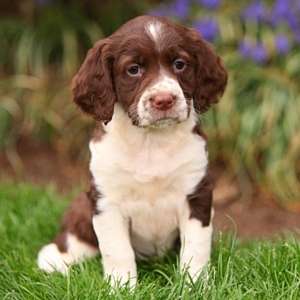 The English Springer Spaniel has been bred over generations to be an efficient hunting machine. Boldly crashing through thick undergrowth to flush out and retrieve game for his owner. To do this he needs to be intelligent and able to follow commands, but he also needed to be brave, strong, tough and have a high prey drive. As working gundogs the Springer can work for hours at a time in rough conditions, happily beating the thorns, bristles, hills and heavy rain to find what he is looking for. This lively breed was officially recognised by the Kennel Club in 1902 as the English Springer Spaniel, having been previously known as the Norfolk Spaniel. The iconic Springer dominated the spaniel presence in the shooting field until the recent resurrection of the working cocker, but are still probably the most popular all purpose working spaniel in the UK today. However, in the last few decades there has developed a deep division between English Springers bred for the shooting field, and Springer bred for the show ring. The English Springer Spaniel have divided in recent years, between working and show bred lines. Although their basic appearances are very similar, with just a few key differences. All English Springer Spaniels are traditionally either liver and white or black and white in colour. Their fur is of medium length, close and normally straight. They are symmetrical in their build, compact and strong dogs of medium size at approximately 51cm (20 inches) tall. What do show bred Springer Spaniels look like? Show bred springers have a more domed head and heavier, longer ears than their working cousins. They also have more extensively feathered coats and are more likely to have loose drooping eyelids. They are also more likely to be similar to each other, as they are bred more for looks than function. What do working bred Springer Spaniels look like? 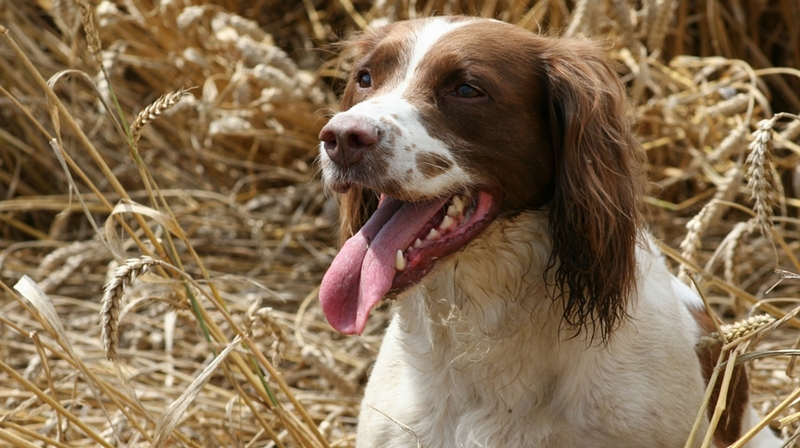 The working bred Springer Spaniel may differ quite extensively between field bred lines, as they are chosen more for their ability to hunt well than for how they look. Field bred springers have become faster and in some cases smaller than their show cousins, with quite a variation in weight and size between different lines. Clean patches of colour have in some cases also given way to a speckled or ‘roan’ appearance, in others they have become almost entirely white. They also tend to have shorter ears than their show cousins, and tighter eyelids as working in undergrowth would be hampered by this. In Britain Springers bred for the shooting field may also be docked, and it is unusual to see a working springer with a full tail. It is not legal in the UK to dock a dog that is not intended for work, therefore show bred English Springer Spaniels will always have full tails. Both working and show bred English Springer Spaniels require attention to grooming. Brushing at least twice a week will help to keep him fairly tangle free, and it’s a good idea to practice this from the day your puppy arrives home. Make grooming fun with lots of treats and praise, and you will find the sessions fairly quick and a great bonding experience. You may also find that your Springer needs clipping every few months to prevent his furry legs and ears from becoming matted and tangled when he gets mucky. Although working and show bred Springers look different, they are actually not that far apart in terms of their looks. The separation between the two types is not as great as it is for example with English Cocker Spaniels. However, in temperament the two strains of springer have diverged quite a lot. Most English Springer Spaniels are friendly and loving to their families, whether they are show or working bred. Although outdoors a show bred dog will probably be far more attentive to his companions, and less distracted by what could be lurking in the undergrowth. However, there is potential aggression issue towards strangers in some lines of English Springer Spaniels, which seems to be far more prevalent in working bred dogs. This is potentially due to these lines having been bred as kennelled dogs, whose owners and breeders were unaware that they had an intolerance to strangers as they simply never met many. The breeding focus was put on working well, and mixing with humans was not a consideration. Regardless of the reason for this troubling strain, if you are buying a working bred Springer meeting his parents is essential to avoid this problem. You may have to travel to see the stud or make special arrangements, but it will be worth it to avoid the stress of living with a dog who is afraid of people he doesn’t know and has the potential to react aggressively as a result. The working English Springer Spaniel is a hard headed dog. He is fast, lively, active and completely crazy about hunting. Although most modern Springer Spaniels are now taken home as family pets, these hard hunting instincts still reside within them. As pets they require a large amount of mental and physical stimulation to prevent them becoming bored and destructive in the home. Working bred springers are intense, driven dogs. They are passionate about following scent, extremely agile and often strong willed and independent. The gene pool for our working Springers is Field Trial stock. These are dogs that have proven themselves in field trials, challenging tests of working ability held under genuine shoot conditions. In all honesty, the kind of dog that succeeds in a Field Trial, is not necessarily the kind of dog you want in your living room during the day. Of course there are plenty of springers from good working stock that, given the right care, fit into family life quite well, but a significant proportion do not. Because of his intense hunting desires, the working bred English springer requires a good deal of supervision outdoors if he is not to get into mischief. 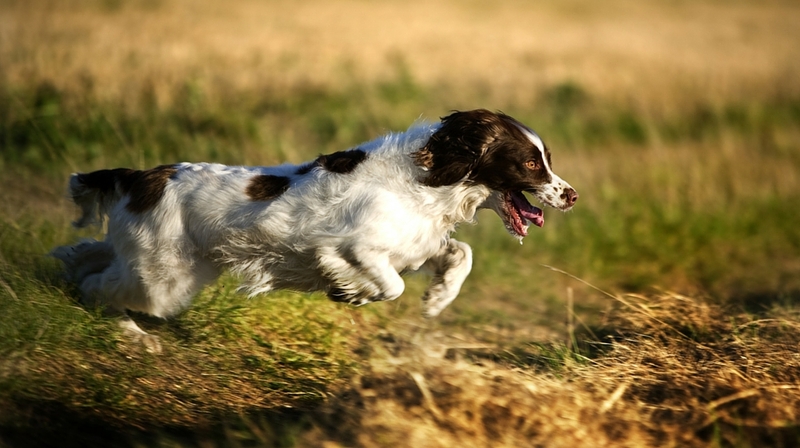 Some lines of working springers have so much ‘drive’ that their behaviour borders on the obsessive when it comes to hunting and chasing wildlife, or anything else that moves. So whilst you might have seen some relatively placid working line springers, if you buy one purely as a pet, you might well still be shocked when you end up with a turbo powered dog that has little to no interest in you once he gets through your front door and the wide world beckons. Because of this sometimes extreme temperament which includes huge prey drive, an independence, toughness, and very high energy levels, a considerable number of working line springers find themselves in rescue homes each year. And because of this, I would recommend you think very carefully before bringing a working strain springer spaniel into your life. If you do nothing else, please read this article: The Trouble with Springers. If you want a quiet life and are not heavily into training or gundog work, the show springer is probably a better dog for you. Show Springer Spaniels will still be lively and have a high prey drive, but they should have less of the intense focus on wildlife and a greater tendency to attach themselves to their families even outdoors than their working bred cousins. They may also be less likely to be nervous around unfamiliar humans as they are bred for company rather than solitary working. Springers, usually from working lines, are widely used in the service of mankind and their efforts are not confined to the shooting field. They are popular drug detections dogs where their astounding sense of smell, enthusiasm and trainability make them great team mates for customs & excises units. And their intense ‘chase’ drive makes it easy to train them using balls games as a reward. 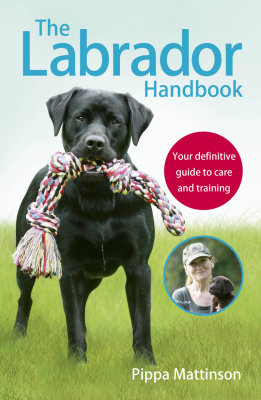 What is often a problem for the pet owner, can be a bonus for the handler interested in creating a working team-mate. Springers thrive with positive reinforcement training, and I would advise learning all you can about these methods before bringing your puppy home. English Springers often excel at activities that use their lively brains and bodies. Dogs from working lines will often enjoy agility and flyball and of course their raison d’être, gundog fieldwork. If you have an English Springer in your life, especially one from working lines, you might want to consider getting involved in gundog style training via The Gundog Club. 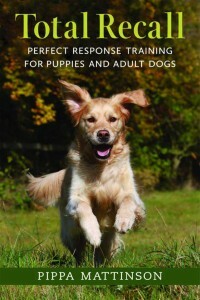 This specialised training helps to harness and control all those amazing urges and instincts that might otherwise lead your lovely spaniel astray. Are English Springer Spaniels Healthy? In general the English Springer Spaniel is a healthy, fit dog. Having been bred historically for function rather than form. However, as pedigree dogs they are still prone to some genetic diseases that afflict many other breeds with a closed gene pool. Hip dysplasia is fairly common in Springer Spaniels. It is a condition characterised by the malformation of the hip socket and can cause severe pain and lameness in affected animals. Hip dysplasia can be detected using an x-ray. 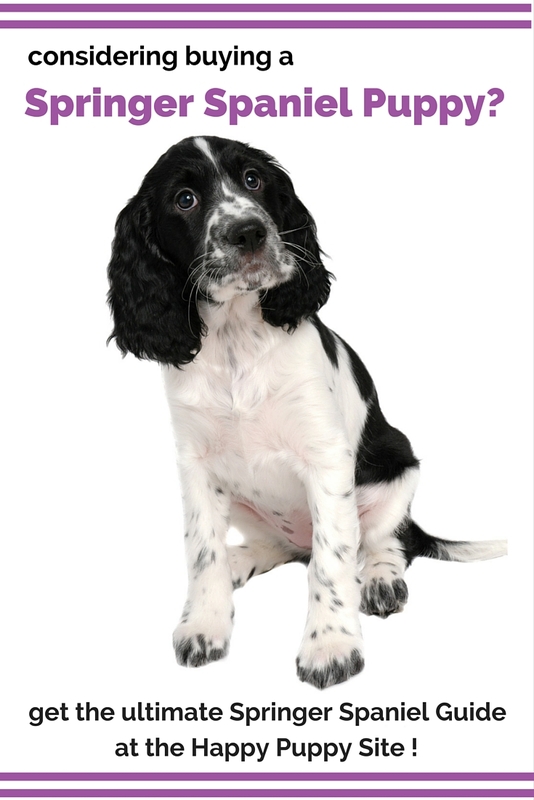 To reduce the chance of your puppy suffering make sure both of his parents have hip scores of above the mean average for the breed – which in 2009 for Springers was 14. Hips are scored on either side of the body, and a balanced hip score is better than an uneven one – so for example you could have a score of 12 made up of 6:6 being better than a score of 12 made up of 1:11, where one hip is considerably worse than the other. There are a couple of inherited metabolic diseases that potential owners of a Springer puppy should be aware of. Canine fucosidiosis is a fatal disease that causes the breakdown of your dog’s nervous system. It is characterised by a loss of bodily control and changes in temperament. Phosphofructokinase (PFK) is the other disease that you need to be aware of, causing abnormalities in the dog’s red blood cells and muscle cells. It causes a fever, poor appetite, prolonged barking and excessive panting after exercise. Fortunately, there are DNA tests available for fucosidiosis and PFK. If your pup’s parents both test clear, then your puppy will not suffer from this nasty condition. English Springer Spaniels have long, floppy, furry ears. Unfortunately, although cute to look at these characteristics create an environment that fosters ear problems. If your Springer is rubbing his head of the floor or scratching at his ears, it is worth taking him to the vet to have his ear health checked. You can also help his ears to stay healthy with regular cleaning. 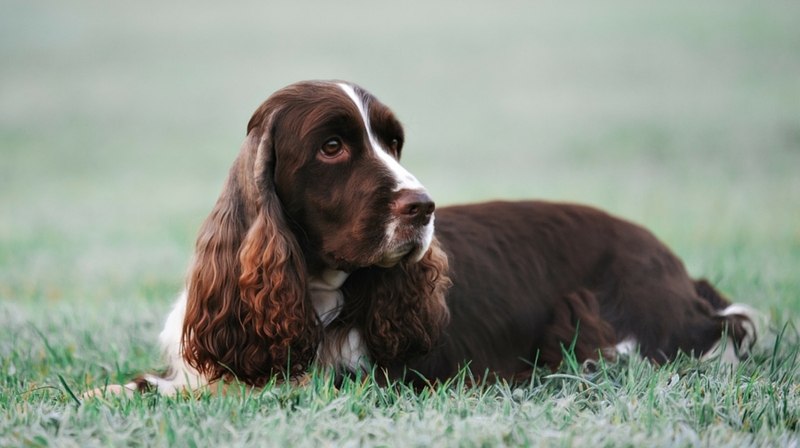 Progressive Retinal Atrophy is a cause for concern in numerous pedigree dog breeds, and the English Springer Spaniel is no exceptional. PRA can result in blindness as it progresses. Fortunately, there is a health test that your pup’s parents can have which allows breeders to only produce litters that do not have this inherited disease. The other common eye problem in Springers is Glaucoma, which causes sight problems due to a build up of fluid behind the eye. It can be either inherited or as a result of an infection. The likelihood of your puppy suffering from the inherited version can be reduced by their parents being given a gonioscopy. This test determines how predisposed the eye is to suffering from glaucoma. Another eye issue for some Springers is entropion – where the eyelid is inverted causing the eyelashes to irritate and sometimes damage the eye. Choosing a pup from parents with good eye health will reduce the chances of them suffering from this. What health tests should I look for? When buying a Springer Spaniel puppy it is advisable to look for a breeder who has tested for Gonioscopy, Fucosidiosis, PFK, Progressive Retinal Atrophy and Hip Dysplasia. Breeders should not be producing puppies without testing the parents first, to ensure that they are free from the diseases that these tests are designed to detect. Is an English Springer Spaniel right for me? Taking on an English Springer Spaniel is a big commitment. The right home for a working Springer is an active one. 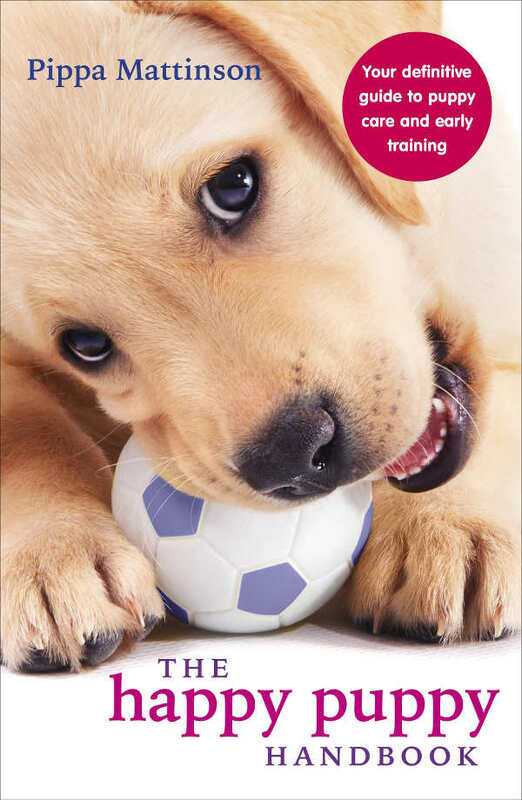 You will need to be very keen to try your hand at positive reinforcement training, and have the time to dedicate to getting it right from day one. A working bred Springer is unlikely to make a good companion on a formal, predictable family walk. But he is certain to be stacks of fun if you are interested in gundog training, agility or flyball. He will happily curl up with you on the sofa if you have had a busy day together, and will cheerfully entertain you, making sure that there is a dull moment. Show bred Springers are still lively, active dogs but they tend to be a little less driven by their prey drive and a little more focussed on their owners. You will find that they are inclined to be a bit more relaxed at home, and conform more directly to type in terms of their appearance. If you think an English Springer Spaniel still sounds like the right dog for you, then deciding between working and show temperaments will be your first big task. However, whichever strain you choose you are certain to have a lot of fun, laughs and love with this gorgeous dog. I had my first Springer that just passed this past November. He would have been 16 years old March 25th, I never cried so hard in my life as when I lost him and still do. My husband thought I was going to lose it i think because we ended up traveling from PA to Ohio to buy one that looked similiar. While there..a liver and white caught my eye,,and now we have 2. I love them. Thegirl however had a heart condition and we had to get her the operation or she’d die within 6 months. That cost clsoe to 7K between the op, meds and check ups., tests. But she was soo precious we had to save her.. She’s as bold as they come but has a strong heartbeat and is doing great . I love these dogs! I know their a handful.. But their worth every bit of it. We absolutely adore our 2 springers …… we got 1st because our daughter has autisim with both learning and complex disabilities and we wanted the perfect dog. My family have shown and bred Pomeranian since I was about 10 and they are a fab dog but when we discovered that our daughter had additional needs I knew we needed a different dog if we were to take 1 into the family. For gran she had 2 litters 15 between the 2, 11 of these went to families in the same situation as ourselves and the puppies have made amazing contact with the child. I’ve also shown an American cocker over 20 yrs ago but for the last nearly 6 yrs and for the rest of my life spaniel will be it for me their nature is second to none. Great article. However, there is no mention about breeding and what age is best to start breeding. Great article on such a beautiful dog, i have a working springer and if bored or under walked would take my house apart!! but with about two hours exercise a day and proper mental stimulation you wont get a better companion. totally fearless and always funny!! great cure for depression they are also extremely loving dogs especially if you can tire them out!! Thanks for a really informative article. 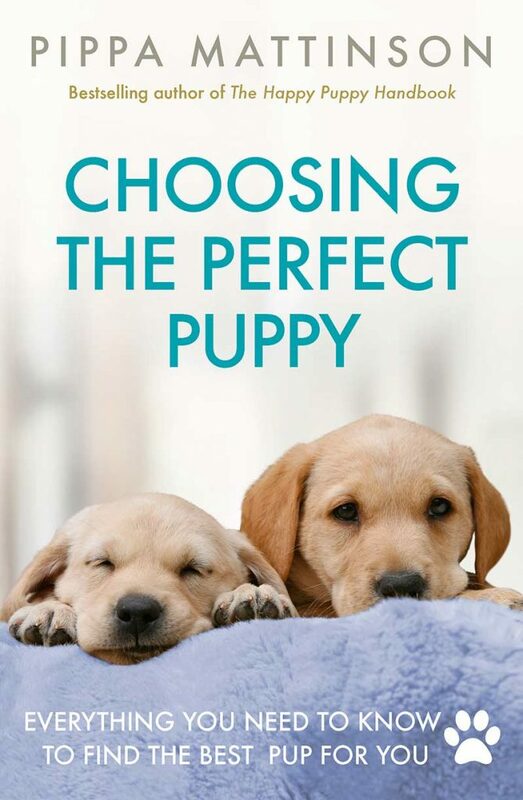 For someone like myself who is looking too get my first puppy next year articles like this are extremely useful in deciding what breed will be suitable for me.